If you have to drill into my wood or metal door, will there be a lot of mess to clean up? You have our personal guarantee that we will leave our work site as clean as we found it or even better. Other than the new installation you will never know we were even there. I need my door lock replaced how long does that usually take? That depends upon the job, most lock repairs/re keying can be accomplished in under 30 minutes. New lock installation with pre-cut doors can usually be completed in approximately an hour. Emergency lock picking to gain entry without lock repair or replacement is a fairly quick and easy job. If there is a complication or parts need to be ordered does that mean my door would be unsecured for a period of time? AA1 Discount Locksmith has been in business since 1980. We have over 35 years of combined experience in the Locksmith business. What brands of locks do you use? Schlage, Falcon, Yale, Baldwin, Arrow, Kaba, Lico, Medeco, ASSA, KWIK-SET. We work with the best because we want our work to last. 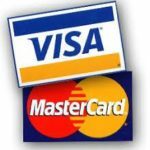 Yes we take Mastercard, Visa, American Express and Discover card.